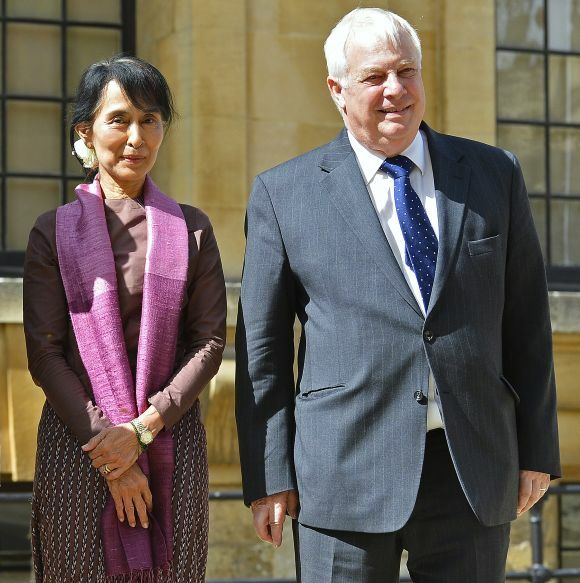 Paying fulsome tributes, the University of Oxford on Wednesday honoured Myanmar's democracy icon Aung San Suu Kyi by presenting her with an honorary doctorate in Civil Law in a traditional ceremony telecast live. Conducted in Latin, the ceremony called Encaenia honoured eight distinguished individuals, including Suu Kyi, who was described by the Chancellor as "star shining in the east, the light of her countrymen". 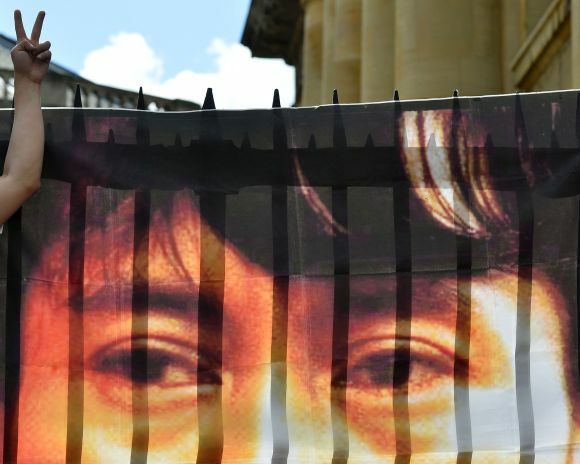 The oration for Suu Kyi, 67, in Latin hailed her achievements and welcomed her back to Oxford where she studied, married and lived for several years, before returning to Myanmar to care for her ailing mother in 1988, never to return, until Tuesday. The oration said: "There is little need of words; for today the line of honorands is led by one whose presence among us speaks more eloquently than any language. We honour her with trumpets, procession and applause, but all this magnificence would mean nothing were it not the outward expression of the hope and admiration deep within us". "This we say to her: 'Of necessity, your return here is a public event, observed by many eyes, but we do not forget that you are also coming back to your old home and to a city full of memories". "Here you studied and formed friendships, here you knew the delights of youth, here as a wife and mother you lived a quiet domestic life, until your love of country and passion for the cause of freedom summoned you back; but you were forced to leave behind a beloved husband and children, so that your return to your native land was made into a kind of exile". Admitting her to the honorary degree of Doctor of Civil Law, the chancellor described her as "unbowed champion of liberty, who have given your people and the whole world an example of courage and endurance". Suu Kyi smiled as she received the degree while hundreds applauded. "For many years you bore the burden of isolation, displaying patience and endurance to a degree not easily imagined. We hail you with joy as you appear in Oxford once more; as for yourself, we do not know what mixture of emotions you feel, and it would be impertinent to intrude on them," the oration said. "But this we declare: your silence has sounded louder than the jabber of politics and the clang of military power; out of deep darkness your little lamp has shone across the planet; your stillness has moved the world. "Sitting in this theatre, we are conscious that we are also spectators of a drama played in the theatre of the nations, one whose ending is as yet unsure. And so for now we wait and hope and pray." Suu Kyi reached Oxford on Tuesday evening after several engagements in London, and celebrated her birthday with members of her family yesterday. 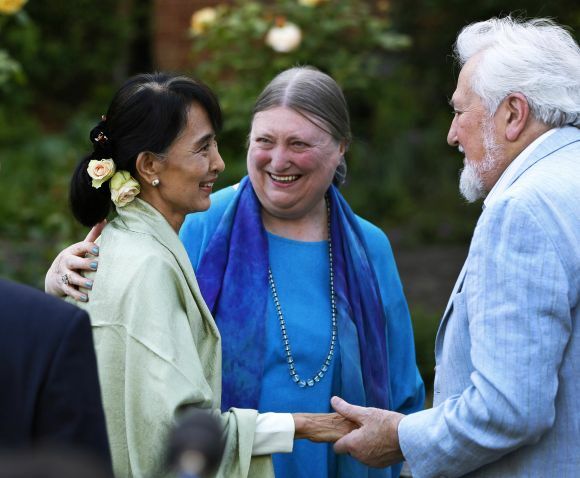 The Myanmar democracy icon, who was under house arrest when she was awarded the 1991 Nobel Peace Prize, is on her Europe tour, her second overseas foray in 24 years.